Who controls Canada’s indigenous lands? 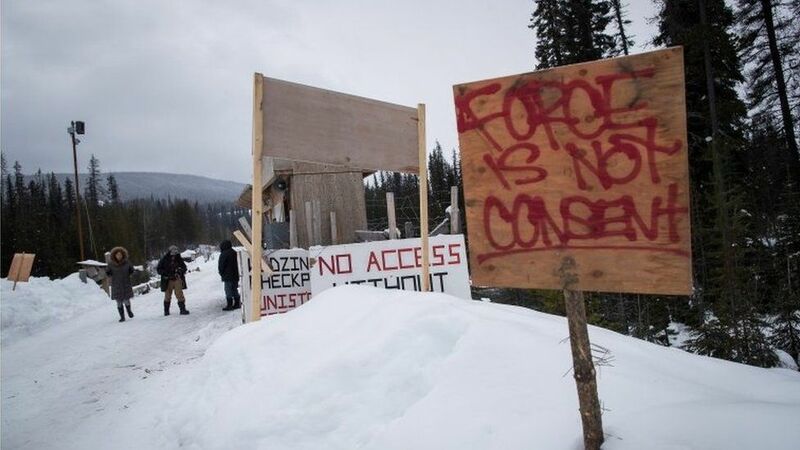 It’s a project which has exposed a rift between elected and hereditary chiefs of the Wet’suwet’en people, who disagree about whether to allow the pipeline to be built through traditional lands. The elected councils have jurisdiction within the boundaries of the reservations to administer federal government legislation, but not the wider traditional territory which the pipeline would pass through. The hereditary chiefs of the Wet’suwet’en nation are stewards and protecters of 22,000 square km (13,670 square miles) of traditional territory, outside the reservations. So what’s behind the dispute, and who have the courts favoured? 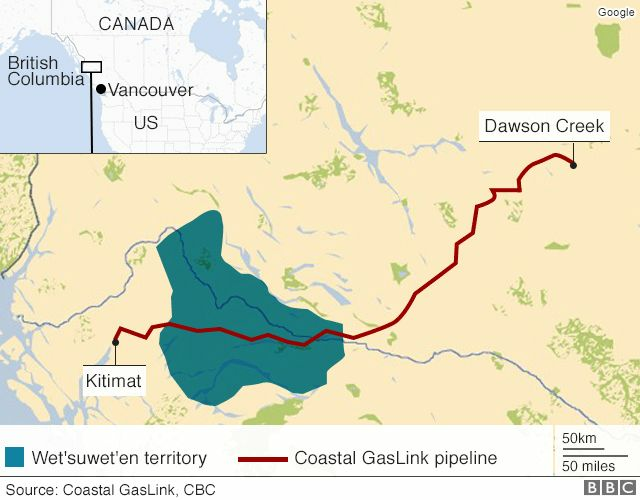 Suzanne Wilton, a communications adviser for the company, told the BBC: “Coastal GasLink initiated consultation with the Office of the Wet’suwet’en Hereditary Chiefs in June 2012 by providing formal notification of the proposed project. Protests by groups supporting the hereditary leaders’ decision have followed near the proposed construction site, and across Canada. At its heart, this is a dispute about who represents and speaks for Canada’s indigenous communities. Responding to a question at a recent town hall meeting , Canada’s prime minister Justin Trudeau highlighted the problem of dealing with two distinct groups of indigenous representatives. “It is not for the federal government to decide who speaks for you. That’s not my job,” he said. The elected indigenous councils were set up by the federal government under the Indian Act of 1876, which defined “Indian” status in Canada, and were designed as a means to assimilate indigenous people. “Canada has a long and terrible history in regards to indigenous people,” said Justin Trudeau at the same town hall meeting. “What’s called the hereditary system is the historic legal and political and economic system of the Wet’suwet’ens, which was in place for thousands and thousands of years before Europeans came to what became Canada,” says Val Napoleon at the University of Victoria in British Columbia. It’s a complex issue as indigenous leadership structures vary across the country. 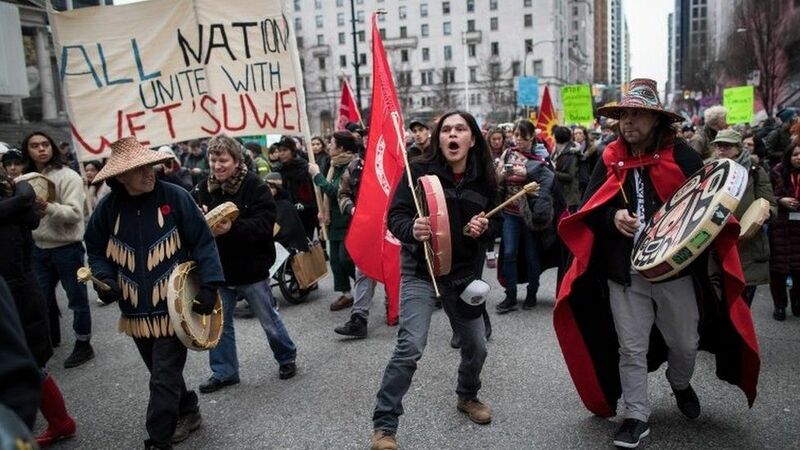 But the forthcoming ruling by the Supreme Court of British Columbia will have important implications for the future of the Coastal GasLink pipeline through Wet’suwet’en territory.